Wildflowers are blooming already since our weather has been so warm. I captured these on some land near me that is a small bit of prairie. 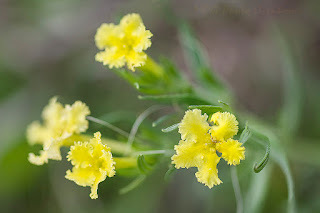 This is Fringed Puccoon that is blooming right now. It's a blend of 2 images to bring out more focus and detail of the plant in a process called Focus Stacking. As a reminder, I have pages here on the site of a lot of the common wildflowers seen here in Kansas that you can use as a reference guide divided out by color to make them easier to ID.